Back when gas was $2 a gallon, we didn’t sweat it. Our biggest concern at the pump was whether we remembered to check the oil. At $3 a gallon, we started to grouse. At $4, we can all agree, it hurts. So imagine what it would be like at $7 a gallon, or three and a half times the price at the beginning of last year. If you can’t bear to, somebody else has. His name is Jeff Rubin and he’s spelled it out in a report he wrote at CIBC World Markets. Here’s the grim scenario Rubin lays out. The Saudis are boosting production by 200,000 barrels a day, but most of that will be sucked up by its own booming economy. China’s cut its fuel subsidies, but gas still costs a mere $3.25 a gallon there. In fact,such subsidies around the world are giving short-term relief at the cost of longer-term pain: Demand stays high, so oil rockets ever higher, closing at $140.15 Monday. Spending more per month on gas than food; diminished purchasing power compared to consumers in Europe or Japan. 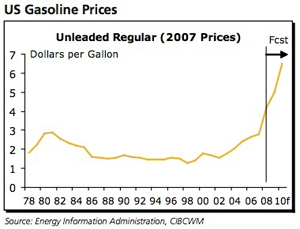 Even the temporary 1979-1981 oil shock led to huge changes in driving behaviour. The prospect of a permanent price regime of $200 per barrel oil should trigger changes that will dwarf the adjustment we saw nearly thirty years ago. In other words, you may have bought a Datsun in 1981 and traded it in for a Ford pickup in 1993. But if you have to ride the bus in 2009, you may well be riding it in 2020. Now the ultimate outcomes don’t sound so bad to some — fewer cars, less pollution. But the transition is going to spread the pain around to everyone. The alternative energies that this blog chronicles will eventually ease much of this pain, but more and more voices are echoing how bad that it will be in the interim. Rubin saves his direst analysis for the report’s end: Oil will follow housing in a devastating one-two punch. An ailing housing market leaves rates low, which means more money greasing the economy. So it may not feel as bad as it is right now. But high oil forces the Fed to raise rates — an excruciating treatment for a painful condition. The most important reason for thinking that the major hit to growth lies ahead rests on the response in monetary policy. As a number of prominent economists, including Ben Bernanke himself, have pointed out, the impact of some of the biggest oil shocks were exacerbated by aggressive Fed tightening…The U.S. economy has managed to avoid feeling the full brunt of oil prices over the last few years, but 2009 will be the year that its luck runs out. Even now, at $4-a-gallon gas, Rubin may sound like a carbon-fuel Cassandra. But his logic is persuasive throughout the report, which should make us wonder how we’ll adjust if his outlook proves to be true. @gus – as others have pointed out, the US is sorely lacking in public transportation. also, driving distances tend to be quite long here compared to most of the UK and much of Europe – many of us can’t afford to live near work, and the screwy zoning system in the US means stores and other necessities are usually spread out and require a lot of driving to get to them. so even those of us who drive small cars and limit driving are stuck burning quite a lot of gas – and money – in the current setup. although the US urban planning and infrastructure is the real problem, it doesn’t appear that the country will be rebuilt overnight. that’s why $7 gas is a bigger mess in the US than in much of Europe. yes gus, but that means if the US is paying $7 then we in europe are going to be paying … $16 ? $20 ? Painful, maybe, but $7+ gasoline is the best thing that could possibly happen to America (and the world), in my opinion. We’ve had the technology to start turning our nation from an oil economy to a nuclear/hydrogen/solar/wind/wave/etc. economy for 20 years. Only now will we actually begin to see that transition manifest itself, and while the process will be a bit ugly, the long-term benefits, both economically and ecologically, will be massive. @Gus I’m half-English and have been able to compare both gas prices and driving behavior in both the US and UK. Prices like that aren’t scary in England and don’t alter my driving behavior but only because they’ve always been similarly high. In the US, suddenly spending a larger percentage of income on gas would definitely be a shock, and at least where I live – an affluent, suburban area – there is no public transportation to speak of. We need to plan for it now and give people attractive alternatives to encourage them to drive less and use public transportation more. Otherwise the transition will really be a shock to the American system. It’s not necessarily that gas shouldn’t cost that much, it’s that we’re not prepared for the change. @Gus: Yes, $7 is hardly apocalyptic, but the transition will still be painful for many in America, where stop-and-go traffic is a time-honored pastime. But far scarier is the prospect of stagflation. @greensolutions: Good points. One would hope that high oil prices would also force us to find ways to make this transition away from oil less reliant on carbon fuels. The worst thing I see about higher gas prices is that it increases the cost of developing renewable energy infrastructure. We have a huge job ahead of us there and it’s gonna take a good amount of fossil fuels to accomplish this. This is why it is so frustrating for me to continue to see renewable energy materials and equipment manufacturers using enormous amounts of natural gas, fossil electricity and liquid fuels to operate plants and distribute products. Thermal processes are probably the biggest culprit and that energy can be replaced or at least supplemented by concentrated solar thermal (it’s not just for death valley, folks). Product distribution is another huge energy hemorrhage and can be alleviated by locating facilities near rail lines and investing in plug-in hybrid tractor trailers. Another terrible thing about high oil prices is that it brings artificial price parity to certain alternative fuels that should never be pursued, such as ethanol. I say “artificial” price parity because these alternative fuels are heavily subsidized and their devastating environmental effects are externalized (soil loss and soil structure collapse, natural gas-derived chemical fertilizers, aquifer, river and ocean pollution through fertilizer, pesticide and herbicide runoff, replacing forests with monocrops, etc.). ….and then there’s oil sands–a source of oil that requires so much energy and so much destruction of boreal forest that it should be clear to the average third grader that it should be left where it is. Then again, there is an upside to high oil prices, like increased efficiency and conservation, true cost indicators discouraging suburban sprawl and encouraging mass transit and rail freight and increased quality of life due to cleaner air, water and soil. $7 gallon. Wow…if only! The price at the pump here (London) is 118p per litre (cheese-eating surrender monkey measurement of volume). That equates to about $11 a gallon. So I am pretty sure you can avoid the Apocalype with those prices if we can. You might just have to stop needlessly burning up large amounts of the earth’s fossil fuels just to carry around 6 empty seats and a dozen cupholders. Sveral tips on this website explain how to save gas and the fundamentals of “Cash Back” gas cards are explained. Try checking out the Drive $marter Challenge (www.drivesmarterchallenge.org). You can enter your specific vehicle data and figure out how much money you can save my taking six fuel-efficiency steps. They also provide other fuel-efficiency tips to help you save on gas costs.